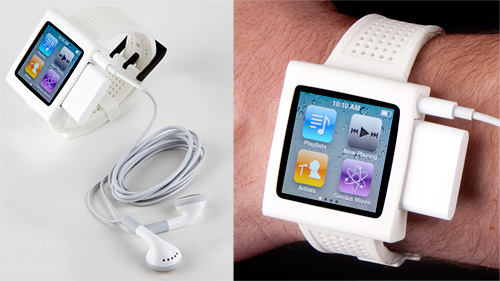 HEX Announces A New Nike Plus Friendly iPod Nano Watch Band | OhGizmo! It seems like there’s a new watch band accessory for the 6th generation iPod Nano popping up every week, and for the most part they rarely bring anything new or interesting to the table. However the new Sport Watch Band from HEX is the first one to accomodate the dongle required for the Nike Plus in-shoe pedometer. I mean it’s not exactly the most ground-breaking innovation, but since the 6th gen Nano has become so popular for workouts, particularly when paired with a watch band, it’s a small improvement that’s sure to make the Sport Watch Band very popular among fitness types. And it will be available in April, probably comparably priced to their existing $29.95 Nano watch bands. This is cute! I think I cana use this while I'm jogging or even while playing golf. Yes, this is definitely not that phenomenal but rather, really simply convenient.